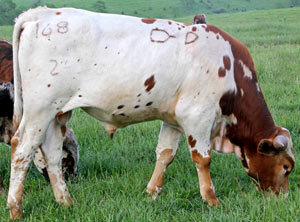 Memo: Hot iron cattle brands have friends and foe. Cattle rustlers hate a clear ID and holding brand. The USDA wants to replace them with computer readers with chips, yet the time honored hot iron brand has worked for thousands of years. The article below gives some good facts about brands and it is surprisingly from a University fellow. This is a perfect brand; about a 3" iron; readable but not over done and not too large. If a brand looks like the guy with the iron was mad, drunk, jittery, iron too hot, hung over, blurred vision, a weight lifter, or using the tip of a scoop shovel to brand --- not good!! The most recent Missouri cattle theft was early in May in Barry county where 13 or 14 head were taken. Don’t let your guard down and not keep close tabs on your cattle. Also, note suspicious vehicles and persons in your neighborhood who seem interested in cattle along the road. Of course unless they’re in a 2000, reddish, Ford Taurus, which could be me. I’ve been known to drive slowly by pastures and do some windshield evaluation of cattle, pastures, weeds, bale rings, mineral feeders, etc. I’ve even had my camera out taking pictures on occasion. There are lots of brands to browse over and many of them are not very good. It is easy to try and put too many characters or designs in a brand. Simplicity tends to make a clearer, more readable brand. Many of the alphabet letters have angles that result in blurred brands unless the corners or angles are rounded. There’s a love to put characters inside a box, triangle or circle, but that may also crowd an area with too much heat which results in a big blurry scar. If you make it large, say 5 inches, you might be okay. Other ideas, instead of a circle consider a half-circle or quarter-circle above or below a character. Use lines, bars, rafters, slashes and back slashes either above, below, before or after a character. Even something as simple as a dot can be incorporated into a very legible brand. Brands are to be at least 3 inches in diameter. Brands can be registered in 6 different locations, shoulder, ribs or hip on either side of the body. The hip is the preferred location due to a bigger muscle, flatter area and usually easier to reach in a squeeze chute. The usual age to brand is around 3 months. This small calf doesn’t fit very well in a typical squeeze chute for branding thus a tilt table could be the answer. Brands do grow, especially when applied to young stock. Some folks use a 2 inch or so brand on the young calves as it will be a 3 inch brand before long. Of course, a 2 inch brand may be difficult to get a clear brand with if the brand is too complex. According to the brand law the brand must meet the 3 inch diameter at the time of application. There are concerns by some that brands may reduce the value of the animal due to hide damage. The most recent beef quality audit shows the discount per animal is only $.74. Considering the value of theft protection and marketing promotion I’d say they outweigh the $.74 risk. Hot iron brands result in more damage to the hide than freeze brands but the latter can also inflict a small value hide damage.